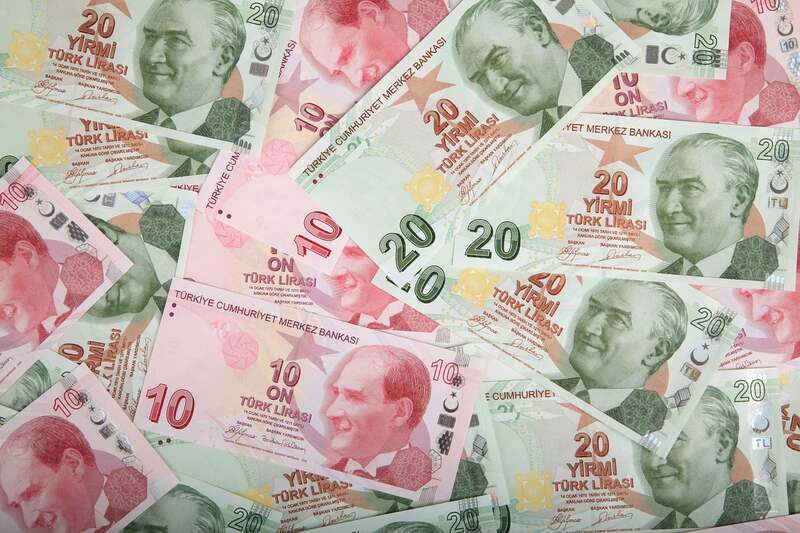 Turkish Lira Devalues: Another Migration Crisis Ahead? The Turkish lira continues to drop today, falling more than 40 percent against the dollar since January. As markets wobble, “reasons” come thick and fast. What is next? No one knows, but here is some analysis of how we got to where we are. When the Turkish lira was plunging into the abyss on Friday, the Financial Times reported that the European Central Bank (ECB) is concerned about the Turkish exposure of some lenders, particularly Spain’s BBVA, Italy’s UniCredit and France’s BNP Paribas, all of whom have significant operations in Turkey. Foreign currency loans are a big portion of the Turkish banking sector’s assets, and the ECB worries that borrowers may not be currency-hedged. In that situation, as the Turkish lira devalues, unhedged borrowers’ liabilities soar, resulting in a much higher risk of default, notes Murray Gunn, Senior European Analyst at Elliott Wave International. "Bearish sentiment towards the Turkish lira is historically extreme. That doesn’t mean a turn is imminent, but it does mean that we’re probably close to, at least, a short-term zenith in Turkey’s panic". Contagion seems to be the main concern of all analysts, with Gunn pointing out Spain, France, and Italy, while others look at Greece. Financial linkages through the banking sector could prove more problematic. 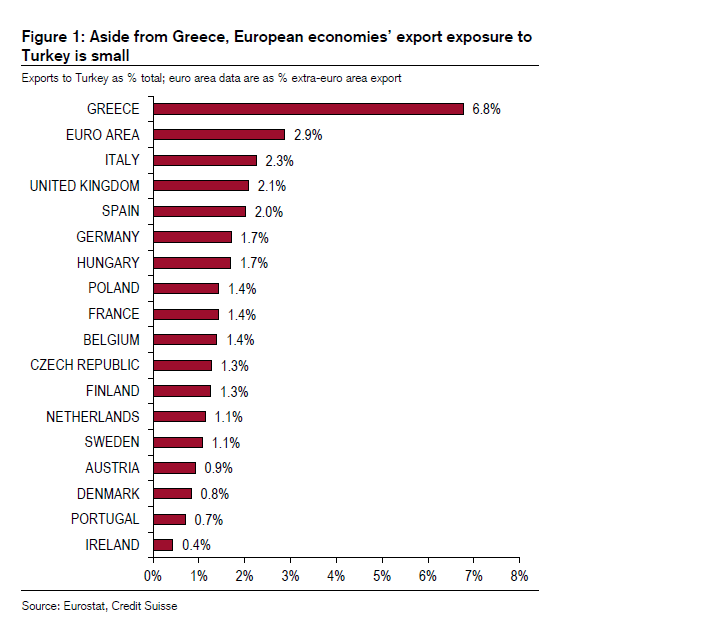 BIS data shows that the Spanish banking system, and to a lesser extent France, has significant exposure to Turkey (Figure 3). In the case of Spain, BIS’ measure of exposure to Turkey is equivalent to around 2.5% of the Spanish banking sector’s aggregate balance sheet. But we would note that this exposure is predominantly ownership of subsidiary banks in Turkey rather than direct loan exposure. That means the potential scale of any losses for Spanish and French banks should be less than these figures suggest. However, they are not insignificant and so could prove to be the main vector of any contagion for to the European economy. Orthodox policy adjustment is required to avoid hard landing We think an orthodox policy adjustment through tight monetary and fiscal may be required. This would attract capital flows and limit depreciation pressures and provide room for fiscal in the medium-term to administer debt restructuring. Given the risks to inflation profile and close the real rate gap relative to the peers, real interest rates should rise to 500bp against peak inflation. Fiscal adjustment should offset the deterioration relative to the budget which we track about 1.5% of GDP. If needed the fiscal room should be used to capitalize public banks and fund debt restructuring plans. One issue that few are talking about is the social and human consequences. Germany and Turkey have been fighting over Syrian refugees escaping from Turkey to the so-called Balkan route and up to Europe. Erdogan's statements on the crisis which have a conspiratorial tint do not bode well for relations on this issue. Furthermore, Syrians aside, if the Turkish economy implodes then millions of Turks could start to flee to mainland Europe which would create another migration crisis for the continent and stability of the EU in particular. That is as important of an issue to watch as much as the plunging value of the lira.